Founded in 1894, North Wales is one of the oldest courses in Wales and was once described by the great Henry Cotton as "a gem". Situated on Llandudno's west shore, this natural links course has long contributed to the attractions of this popular holiday resort and helps to make the area a magnet for the golfing tourist. 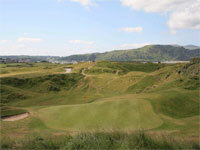 Players playing North Wales for the first time should leave their hooks, pulls and uncontrolled draws at home because out of bounds features on a number of holes throughout the course. Take on the back to back par 3's in the sand dunes "O Hell" and "Hello" and come away with par and a big smile!